To brighten up your pre-bank hol Thursday, iconic high street brand Reiss are offering 10% off everything in-store and online today. Eagle-eyed La Fashion Folie readers may have noticed that the blog recently became affiliated with Reiss. When looking for blog affiliates, my golden rule is that I only seek to partner my blog with brands that reflect my personal style, and Reiss is one of those aspirational, luxurious brands I’d wear everyday if budget permitted! To get you inspired, here’s a video of the brand's dreamy high summer ‘Prints and Palms’ campaign video, shot on location in uber-glam L.A. My favourite pieces in the collection are diaphanous printed maxi dresses that will take you from poolside to party for your upcoming summer hols. Visit the Reiss online shop. 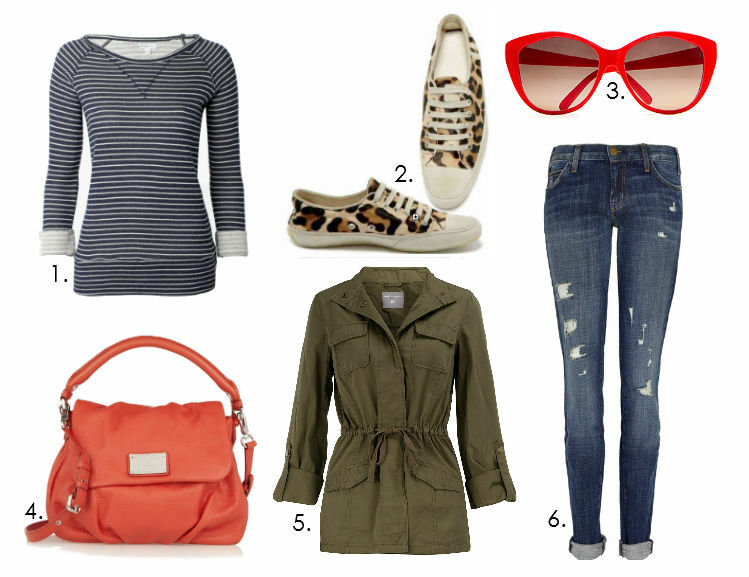 To kick off the Queen’s Diamond Jubilee in style, theOutnet is celebrating by offering up to 70% off British designer fashion. The Outnet’s ‘Rule Britannia’ sale kicks off at 10am tomorrow and if the sneak-preview that pinged into my inbox this afternoon is anything to go by, it looks set to fabulous. From the classic, (the timeless Burberry taupe trench) through to the eccentric (I’m seriously tempted by Christopher Kane’s gel-filled clutch), there’s so much to be said for the charming British sense of style. 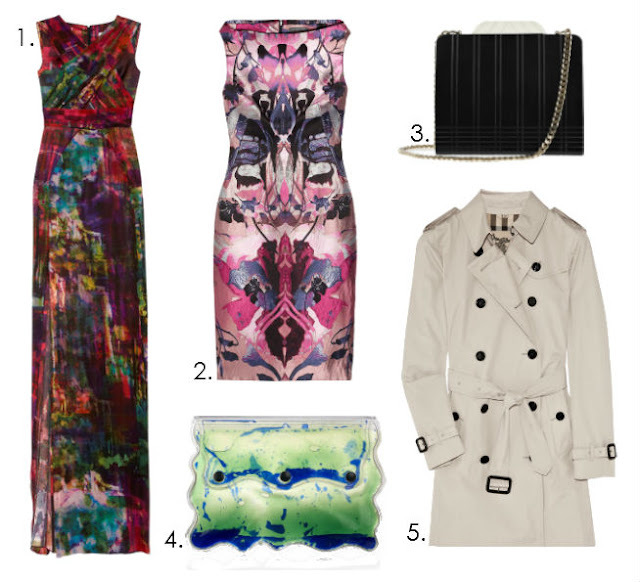 Here’s LFF’s picks to look out for when the Outnet sale kicks off tomorrow. See you at the e-checkout! 1. Erdem Astrid printed silk-voille dress, £1,232 reduced from £3,080. 2. Alexander McQueen Galle metallic silk-jacquard dress, £1,432 reduced from £3,580. 3. Stella McCartney Plexiglass clutch, £329 reduced from £940. 4. Christopher Kane Aqua gel-filed PVC clutch, £231 reduced from £385. 5. Burberry short twill trench coat, £357 reduced from £595. Shop the e-sale from 10AM BST tomorrow. 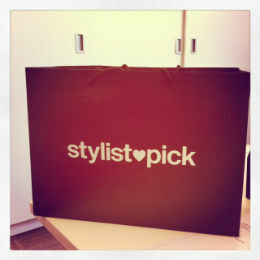 When I was offered the opportunity to review the Stylistpick service, I was a little over-excited. Having worked in the head office of a high street footwear brand, I like to think of myself as a shoe connisseur (although I'm definitely no expert) and I couldn't wait to have my very own pair of Stylistpick shoes. 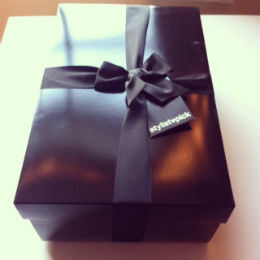 Shoes aside, what I really liked about the Stylistpick service was the attention to detail. My shoes arrived on my office desk a very punctual 3 days after I placed my order (that was standard delivery) and came in a stylish carrier bag inside the delivery box. This was clever stuff- the number of times I've struggled home with a shoe box after getting my online shopping delivered to the office is countless. Inside the bag I discovered another lovely detail- a polaroid picture with a picture of my 'Rosie' sandals; perfect for the organised shoe collector. Then I pulled out the shoebox inside to discover it was wrapped with a pretty bow- it's these adorable little details that make all the difference. 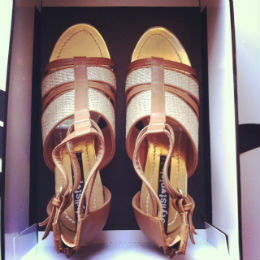 And finally, my thoughts on my hessian-detail 'Rosie' sandals inside? Well, they look much more expensive than their price tag and I haven't seen anything similar on the high street. And the best bit? We finally have some sandal-appropriate weather! Perfect. 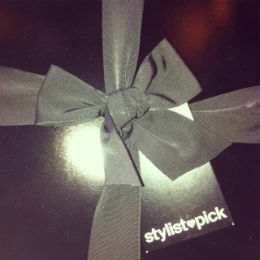 Become a member of Stylistpick. 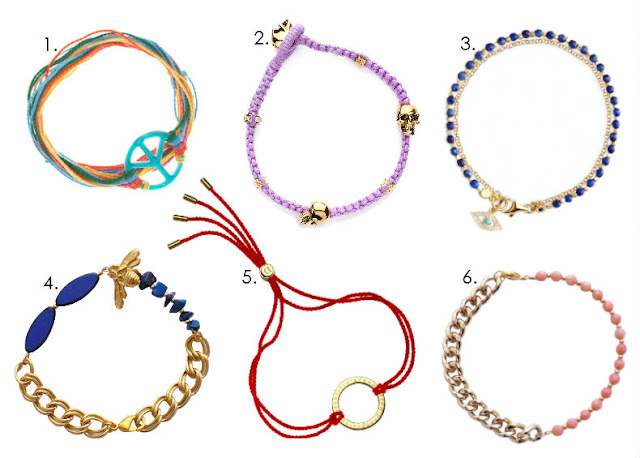 A HUGE trend in fashion and jewellery at the moment is layering up friendship bracelets. Personally, I am a massive fan of this trend because it is an easy and fun way to add some interest, colour and individuality into your everyday wardrobe. The key to getting the layered look right is to mix luxe with low-cost; a handmade friendship bracelet contrasted against an expensive designer timepiece looks both modern and interesting. Here's a perfect example of the trend in action from one of my all-time favourite bloggers, Taylor Sterling of Sterling Style. 1. 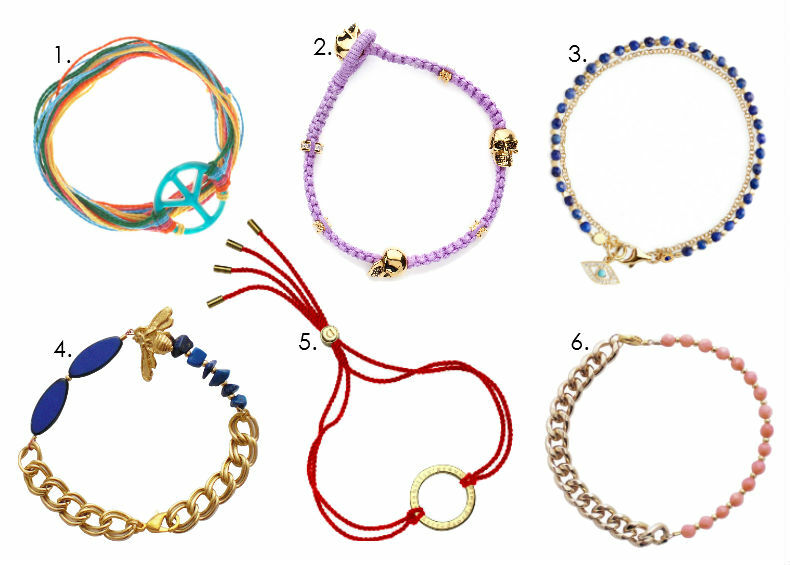 Aurélie Bidermann peace charm bracelet, net-a-porter, £65. 2. Purple skull bracelet, Kabiri, £45.00. 3. Evil eye friendship bracelet, Astley Clarke, £135.00. 4. Lapis Lazuli Bea bee bracelet, Cinderela B, £35. 6. Luxe neon sea bamboo bracelet, Cinderela B, £22. Bianca Brandolini D'Adda in Dolce and Gabbana, Carey Mulligan in Prada and Lana del Rey in Altuzarra dazzled in metallics on the red carpet. Gwyneth Paltrow in Prada, Emma Stone in Lanvin and Victoria Justice in McQ by Alexander McQueen proved fabulous doesn't always have to be full-length. Coco Rocha wearing Elizabeth Taylor's (yes, really!) vintage Givenchy pant suit, Solange Knowles in Rachel Roy and January Jones in Versace all brought citrus-yellow sunshine to proceedings. Flaunting some serious plumage were Beyonce in Givency Haute Couture, Cate Blanchett in Alexander McQueen and Kate Bosworth in Prada. For more Met Gala fashion visit Zimbio galleries. 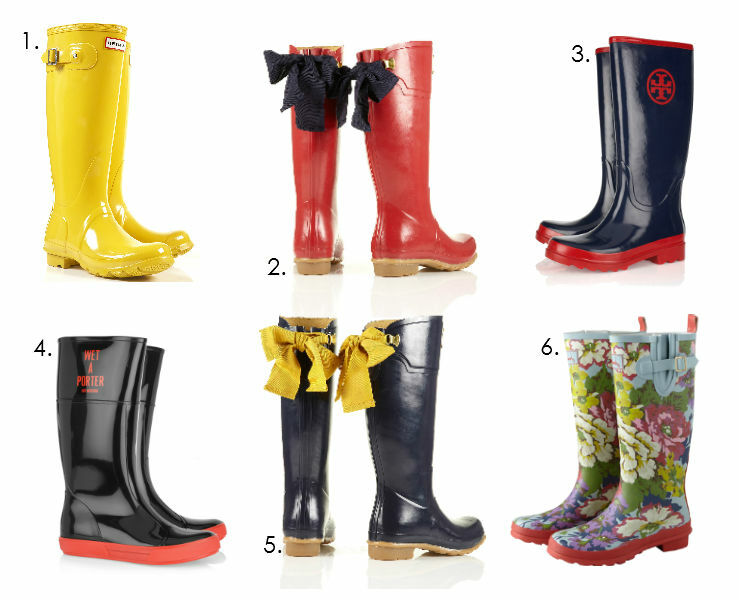 Work the wet weather to your advantage and use it to make a splash in some bright and beautiful rubber wellies. As a girl born and bred in the countryside, I'm actually partial to a simple khaki green welly, but in the city this countryside staple can look a little out of place. Luckily there are some gorgeous high-fashion styles out there that will look chic for the commute to the office. Here's my favourite wellingtons that can be shopped online now. 1. Hunter original wellies, Topshop, £80.00. 2. Joules Evedon red ribbon wellies, Topshop, £65.00. 3. Tory Burch wellington boots, The Outnet, £58.50. 4. Moschino Cheap and Chic Wet-a-porter wellingtons, Net-a-porter.com, £125. 5. Joules navy Evedon ribbon wellies, Topshop, £65.00. 6. Floral print wellies, Joules, £36.95.